LAHORE: (Wednesday, December 5, 2018): Punjab University Institute of Languages has celebrated international human rights day to highlight the significance of provision of equal rights and create awareness among the masses through cinematography. 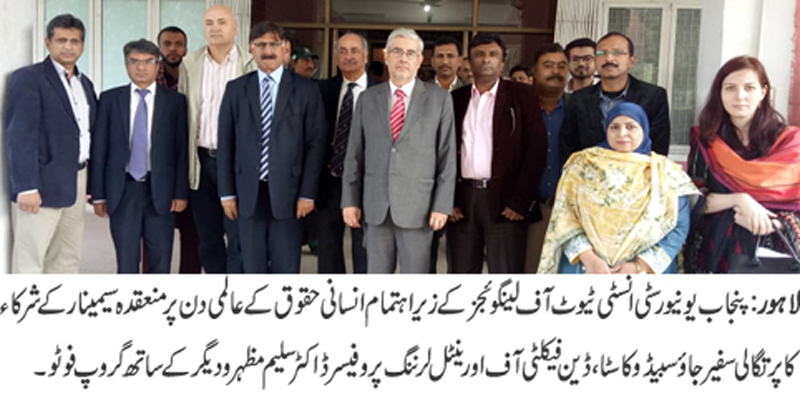 The ceremony was organized at New Campus in which Portugal’s Ambassador Jõa Sabido Costa, Dean Faculty of Oriental Learning Prof Dr Saleem Mazhar, Professor Roberto Titoli from Italy, Mr. Iftikhar Feroze, Dr Aman Ullah Malik, Incharge Institute of Languages Mr Ashok Kumar, Dr. Eketerina, faculty members and students were present on the occasion. Addressing the seminar, Mr. Jõa Sabido Costa said that it was very important to take care of basic human rights now as all over the world the powerful were crushing the weak. He said that Portugal was very much interested to work on these sensitive issues concerning the abuse of basic human rights. He said that in future there would be chances of exchange of teaching faculty programs so that teachers from Portugal might come to Pakistan to teach not only Portuguese language but also culture. He also offered a small documentary about the famous football player Ronaldo after the main documentary. Dr. Muhammad Saleem Mazhar first of all thanked all the guests and expressed his views about human rights and the role of Portugal becoming the first in world to accept Pakistan as an independent state right after its coming into being. He further expressed that we want to go ahead in future and we should have more such events so that the students of our university might become aware more about the culture and languages of other countries. He very warmly welcomed all the guests. Mr Amanullah Malik, Iftikhar Feroze and others also spoke. A documentary film on the topic of human rights was played which was in Portuguese language and the students learnt a lot about this documentary as it had subtitles in English. Many Portuguese people expressed their experience about their past. All the audience watched this documentary with keen interest and got a lot of ideas about working on Human Rights campaigns in future.